Damage caused by Hurricane Idai in Mozambique has once again mobilised Cuban solidarity, with a medical brigade from the Henry Reeve Contingent, specialised in disaster situations and serious epidemics, providing help in the city of Beira, Sofala province. The extreme weather left 468 dead, while another 259 perished in neighbouring Zimbabwe and at least 56 in Malawi. Some three million inhabitants of the region suffered damage during the storm, described by UN Secretary General Antonio Guterres as one of the worst weather-related disasters in the history of the African continent. 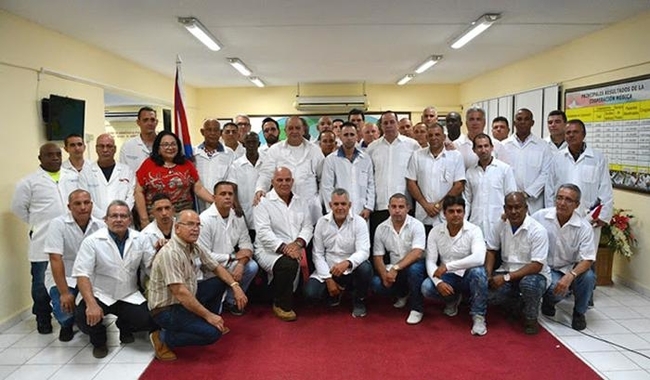 The brigade’s 40 members travelled with a field hospital donated by Cuba with spaces for consultations, operating rooms, a clinical and microbiological lab, imaging equipment, plus 20 hospital beds. Included in the group are specialists in Comprehensive General Medicine (MGI), surgery, internal medicine, pediatrics, gynecology, orthopedics, epidemiology, and health technology, who will join the more than 270 Cubans already working in the country, where our medical collaboration has been present since 1975, when independence was declared. Dr. Miguel Zorrilla Quiñones, a comprehensive medicine general practitioner, from the province of Pinar del Río, told Granma International that, when tragedy struck Mozambique on March 27, the Cuban government immediately proposed sending solidarity and began to prepare to depart, gathering information on the location and the epidemiological situation. He has experience working in other countries: first in the Venezuelan state of Lara from 2001 to 2006; then in Pakistan in the wake of the 2006 earthquake there; in Angola (2006-2009); and Brazil (2015-2018). "In Mozambique I expect to find families with medical assistance needs and we will make every effort to resolve all the difficulties that the people are facing, as quickly as possible." A similar comment was expressed by Dr. Ralfys Armando Carbó Sánchez, obstetrician at the Pedro Betancourt hospital in Jovellanos, Matanzas, who provided services in the city of Ebebellín, in Equatorial Guinea from 2008 through 2010, and treated patients with conditions rarely seen in Cuba. “I was the only Ob-Gyn. Also working there were a surgeon and a pediatrician, with two comprehensive medicine general practitioners. We organized shifts in general medicine and each of us faced all the ailments with which the population arrived at the emergency room. If a specific situation occurred, the specialist was called, so we were on duty 24 hours a day,” the doctor said. There was malaria, HIV/AIDS and typhoid fever, so he began prevention and health promotion work in suburban areas and distant villages to explain hygienic-sanitary measures to address these illnesses. During these community visits, he carried medicine to treat chronic non-infectious diseases and diagnose possible epidemiological conditions, while participating in the existing national program entitled “Growing without malaria,” offering educational talks on measures to be taken to control spreading the disease. "I have several anecdotes to recount, but I was especially moved by the case of a pregnant woman who came to us in very serious condition. She had been in labour for five days, with very high blood pressure. She had convulsions when she arrived and without many material resources available, I was able to save her life. Neither she nor the baby died. Later, she came to visit me several times and thanked me for my efforts," Carbó said. He also lived the experience of treating women who had abortions under poor sanitary conditions and developed infections due to these unsafe procedures. In these cases, he was obliged to use all his knowledge to assist the women, and is proud to say that in his two years of service, he had no maternal deaths and the infant mortality rate was reduced. Getting ready to leave for Mozambique, he received updated information and participated in professional classes on cholera and malaria, since these are two diseases that can trigger epidemics after flooding occurs. "We discussed the prevention and prophylactic work we must carry out, mainly by presenting hygienic-sanitary talks." He underwent medical tests to determine his health parameters and was vaccinated to prevent endemic diseases that have been eradicated in Cuba. He reviewed steps to take to avoid getting sick and updated his medical file, that he will take along, with this recent clinical evaluation. For his part, registered anesthesiology nurse Serguei León Alonso, from Villa Clara, who just arrived from Guatemala where he served in a hospital operating room, in the city of Ixchiguan, San Marcos province, commented, "In Mozambique I will face a difficult epidemiological situation. I expect to see the population very sad and in pain, after witnessing a great catastrophe," the young man said. He said he was proud to have been selected to work in these circumstances to show the humanism of his profession, something learned over the many years of study, and as part the legacy of Fidel Castro’s life and thought, who instilled in Cubans the desire to help the most needy even if they live in faraway, remote villages, adding, "Every health professional should be wherever duty calls," Leon said. He points out that Cuban professionals have sufficient academic preparation to adapt quickly to change and find solutions to their problems and those of others. His assignment involves providing clinical therapy to the local population and his own colleagues, who will no doubt experience difficult moments, given the complex situation they will face in Mozambique. "For me this is about fulfilling a duty, leaving a legacy, that is, to be part of the history of Cuban medicine."